Ah, almost forgot it’s Friday, time for another video. In this video we look at some of the design options available for survey questions in Voice of the customer, including piping CRM data, scoring, and display elements. Is JasJar supported also? I’d love to be able to use CRM MS-DOS Mobile on my trusty JasJar. I tried to open up the link but keep getting 404’s. Hey Mehmet, double-check that you’ve got your IMEI number correct – it’s a long one, may take few attempts to get it right. Once entered correctly, CRM Online will automatically (after a prompt, naturally!) 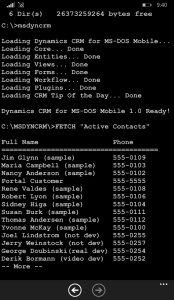 push CRM MS-DOS Mobile binaries to your phone – easy as! Hi! how can I make question type ‘upload file’ to be mandatory/required response? I don’t believe that you can.